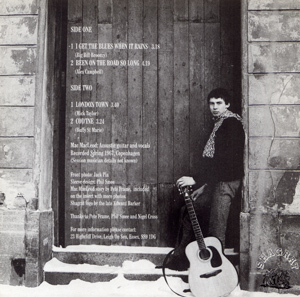 Acoustic four-track EP by recorded in Copenhagen in early 1967 prior to Mac joining Danish psychedelic power trio Hurdy Gurdy. A stalwart of the Hertfordshire early 60s folk scene alongside Mick Softley, Macleod had been instrumental in getting the young Donovan started - Mac had played with the latter at the NME Poll Winners show at Wembley in 1965 and gone on to the national tour that followed. He'd then formed a duo with a young St Albans singer Maddy Prior and had been making some headway as a duo, Mac & Maddy, when on a whim he set off to do gigs in Sweden. After a period living in Stockholm, Mac and young wife Stella headed down to Copenhagen where he was involved in the Exploding Mushroom! These four numbers recorded for an aborted solo LP are a perfect evocation of mid-60s, free-wheeling, pot-smoking beatnik folkie. 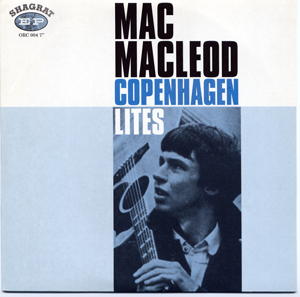 Mac covers songs by the likes of Alex Campbell, Buffy St Marie and Big Bill Broonzy. For anybody who digs Softley, Donovan, Renbourne, Jansch et al this is a must.